The Mora Smoothie fashion blog, DIY fashion by Paola Buonacara: DIY earrings with starlets! 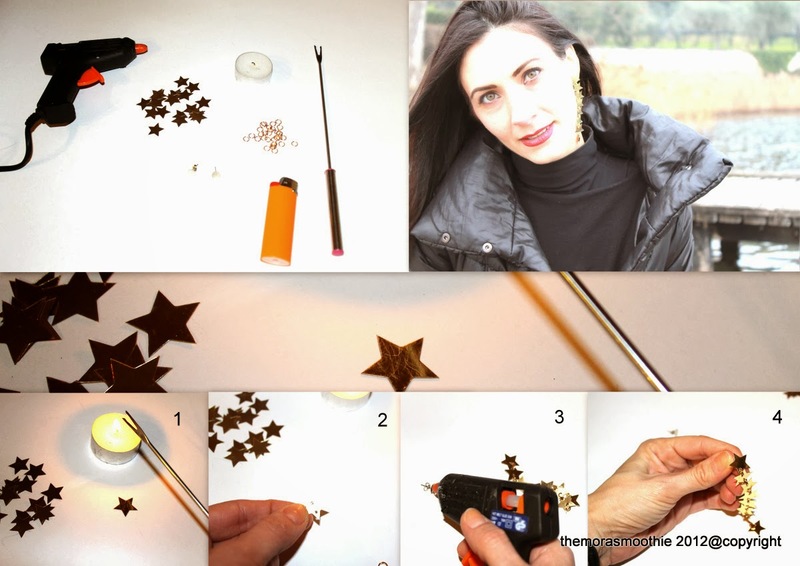 Essential: starlets, candle with lighter, a little metal fork, earrings closure, little circles and hot glue. Tutorial: I warmed up the little metal fork and so I holed the starlets, making two holes on each one, with the exception of two (they will be the first and last), after I mached them with the little circles and then I applied the closure with the hot glue. Brilliant effect with easy material and low cost in a short time... do you like them? Necessario: stelline, candela con accendino, una forchettina di metallo, chiusura per orecchini, cerchietti e colla a caldo. Tutorial: ho scaldato la forchettina ed ho così bucato le stelline, facendo due buchi su ognuna, eccetto su due stelline (saranno la prima e l'ultima), dopo le ho unite con i cerchietti ed ho poi applicato con la colla a caldo la chiusura. Effetto brillante con materiale semplice e a poco costo in poco tempo... vi piace? Good The Hourglass emoji possesses been mentioned greatly in an early on content. Emojis on Snapchat It as well assists as public facts of your acquaintanceship. nice. good with download and install as well as setup mobdro apk Generally, Mobdro is an android application best,.